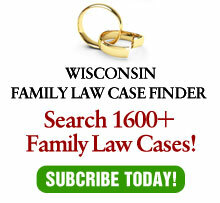 In a previous article, we looked at the Wisconsin Supreme Court’s significant family law cases from 2004. In this article, I will focus on significant 2004 cases decided by the Wisconsin Court of Appeals. On the positive side, two court of appeals cases resolved – hopefully once and for all – the frivolous argument that Wisconsin’s placement statutes are unconstitutional for not presuming equal placement between the parties. In Arnold v. Arnold, 2004 WI App 62, 270 Wis. 2d 705, 679 N.W.2d 296, the court of appeals upheld the constitutionality of the physical placement statutes in prejudgment cases, while in Lofthus v. Lofthus, 2004 WI App 65, 270 Wis. 2d 515, 678 N.W.2d 393, a different panel reached the same conclusion regarding postjudgment cases. Also in the area of custody and placement, in Paternity of Nicholas B.P., 2004 WI App 126, 275 Wis.2d 311, 685 N.W.2d 546, the court held that the presumption that joint legal custody is in the child’s best interest set forth in WIS. STAT. § 767.24(2)(am), applies only in initial legal custody determinations, not in modification determinations. This is a critically important decision as it weighs the importance of stability for children against the statutory interest in shared-time placement. As I said in our article analyzing the case, while the majority of the court of appeals engaged in a theoretical exercise to find a metaphysical “legislative intent”, the final result promotes consistency for children. It seemed that the appellate court was completing the legislative process, while camouflaging its decision as “ascertaining” legislative intent. After the high court granted review, the appeal was voluntarily dismissed in November 2004 – so the decision will remain the applicable law. Additionally very welcome was the decision in Cashin v. Cashin, 2004 WI App 92, 273 Wis. 2d 754, 681 N.W.2d 255, which among other holdings, clearly allowed a trial court to charge interest on maintenance arrears. While the family law statute requires interest for child support arrears, it is silent for maintenance arrears and this decision resolves an oft-argued issue. But of all the court of appeals decisions this year, I am most fond of the holding in Maritato v. Maritato, 2004 WI App 138, 275 Wis.2d 252, 685 N.W.2d 379, concerning, among other matters the valuation and division of vested and unvested stock options. The court was kind enough to cite with approval – several times – an article which I wrote, Stock Options In Divorce, 19 Wis. J. Fam. L. 61, 61 (1999). The court agreed with my analysis that the trial court has discretion in to include (or not) unvested options in the marital estate and how to value underwater and above-water options. Wise court. More problematic was the holding in Rumpff v. Rumpff, 2004 WI App 197, 688 N.W.2d 699, which affirmed a trial court order which determined the application of the shared- placement guidelines solely by counting overnights. By doing so, the court of appeals decision may have the effect of repealing the “equivalent care” clause in the guidelines. As noted in this column, other than providing meals, it is difficult to conceive of what costs can be claimed due to extended placement. If only overnights count, the ironic effect is that actual economic expenses do not effect child support. The second interesting holding in Rumpff was affirming the trial court’s preference of using percentage guidelines over variable costs, at least partly to avoid future litigation. While the trial court is undoubtably correct that sharing variable costs is an invitation for fighting, it is difficult to conceive of a divorced couple of whom this would not be true. Unfortunately, no review was sought in the supreme court. However, the award for the most problematic decision of the court of appeals in 2004, at least in the family law area, was Lawrence v. Lawrence, 2004 WI App 170, 687 N.W.2d 748, which held that an agreement of the parties to use a third party as an impasse-breaker for choice of schools is enforceable and not against public policy. Not only did this decision surprise most practitioners, who have long assumed that custody decisions could not be delegated to third parties, but it seems to contradict, without even citing, the supreme court decision in Franke v. Franke, 2004 WI 8, 268 Wis. 2d 360, 674 N.W.2d 832. In Franke, the high court held that a circuit court may relieve a party from property division provisions of a divorce judgment under WIS. STAT. §806.07, even though the divorce judgment incorporates a confirmed arbitral award. While the result makes many placement cases easier to negotiate, I am surprised at the seeming inconsistency it creates in the law. It would seem that it would be more important that a custody/placement issue requires judicial review than for a property division issue. Apparently, however, the law is to the contrary. Again, no review was sought in the supreme court.